Syrian army, Lebanese Hezbollah and other Quds Force-led fighters supported by Russian warplanes made advances against the opposition on Monday in the fiercest clashes since Wednesday, when pro-Assad forces launched their first new offensive backed by Russian air power. The Syrian Observatory of Human Rights (SOHR) said pro-Assad forces seized the southern part of the town of Kafr Nabuda in Hama province in western Syria. The capture of Kafr Nabuda would bring government forces closer to opposition-held positions along the main highway that links Syria’s main cities. In Idlib, the other area under intense Russian bombardments, the government forces captured the town of Tal Skik in southern part of the province. Idlib lies east of Assad’s stronghold of Latakia. UPDATE: Reports on Twitter accounts on Monday say the fight between the pro- and anti-Assad forces in Kafr Nabudah has intensified, with some saying the opposition forces are pushing the government forces out of southern Kafr Nabudah that they had captured earlier today. Meanwhile, ISIL scored significant gains on Friday near Aleppo, where the insurgents took a number of villages near the city and threatening to cut off an important route north to the Turkish border. 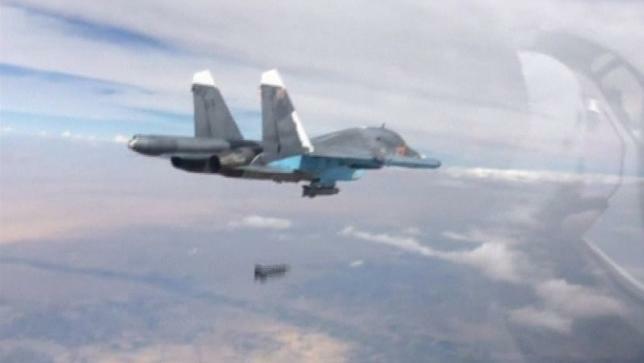 An opposition source told Reuters that Daesh has exploited the Russian airstrikes and the preoccupation of the Free Syrian Army in its battles in Hama to advance in northern Aleppo. On Thursday, Gen. Hossein Hamedani, the most senior IRGC officer in Syria, was killed in action. SOHR said the general was killed near the Kweiris military airbase east of Aleppo. Aircraft based there are often used to bomb Al Bab, a city held by ISIL. The New York Times also reported on Monday that the pace of antitank missile deliveries to the opposition has picked up since Russia began providing air support to pro-Assad forces in their new offensive against the opposition last week. UPDATE: U.S. forces on Sunday carried out an airdrop 50 tons of small arms ammunition to Syrian opposition, two weeks after Russia raised the stakes by entering in the four-year-old civil war on Assad’s side, Reuters reported today. Russia presence not only gives air support but also opens up a channel for Iranian ground forces to come in in numbers without provoking further response from the Saudis and US. Iran could not send troops in without being matched by Turkey and Saudis but Russia presence changes that. where they were less successful? without strong airforce , you are powerless. I wonder. If Syrian and Iraqi Kurds could be persuaded to make a commitment to federations within the existing states, could the Turks and Russians find common ground. Russians and Iran guaranteeing Assad and Bagdad. Turks stabilising Sunni held area's with boots on the ground. A ceasefire. Cause for elections and the strangulation of ISIS.